Was the Porsche Cayman GT4 RS With a 4.0-Liter Engine Leaked by a Dealership? An Australian dealership appears to have posted confirmation of the 911 GT3 RS-engined Cayman on Instagram. But we're skeptical. An Australian Porsche dealership has apparently confirmed the rumored upcoming Porsche Cayman GT4 RS, complete with a 4.0-liter flat-six engine. Well, maybe. We at The Drive are still a bit skeptical. Not that the Cayman GT4 RS is coming, nor that it could be powered by a version of the 4.0-liter boxer engine derived from the 911 GT3 RS's motor. No, we're skeptical as to whether an unsubstantiated social media post should be taken as confirmation of a new Porsche. Here's the thing. 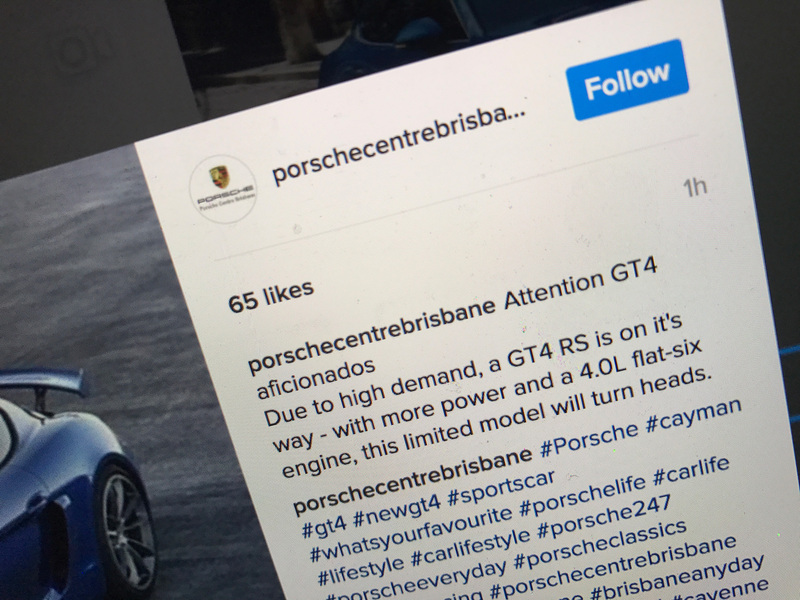 According to a screen grab of the Instagram post from Porsche Centre Brisbane, the original post—which appears to have been written as the caption for the same picture of the original Cayman GT4 we pulled for the image above—read, "Attention GT4 aficionados Due to high demand, a GT4 RS is on it's [sic] way- with more power and a 4.0L flat-six engine, this limited model will turn heads." Which is to say, there doesn't appear to have been any thing to suggest that Porsche Centre Brisbane didn't just post the same rumor The Drive wrote about in mid-January. Hell, they could have read about it on our site for all we know. The idea of a GT4 RS makes all the sense in the world. Porsche has made a career of cranking out increasingly crazy performance variants (hey there, 911 GT2 RS), so a hotter version of the Cayman would surely sell like hotcakes. Using the GT3's (presumably detuned) 4.0-liter motor is a logical assumption, too; with Porsche's desire to keep its RennSport models naturally aspirated (at least for the next few years), there aren't many engines left in the lineup to grab that make more power than the GT4's current 3.8-liter flat six. But just because a Porsche dealership Down Under posted about it doesn't mean it's necessarily confirmed. Especially since they didn't provide any new information. Then again, remember how we said we were judging this off a screen grab of the Instagram post? That's because the original has apparently been taken down. So make of all that what you will.